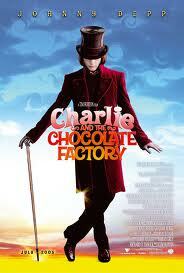 Last Saturday, I saw a film called Charlie and the Chocolate Factory. It was pretty nice. It is based on a book. The main character in the film is Charlie Bucket who is a kind loving child growing up in a very poor family. He lives with his mother, father (who was recently laid off from his job at a toothpaste factory), and his four grandparents directly down the street from the famous chocolate factory.Many years ago, the owner of the factory, Willy Wonka, had decided to close it because other chocolate factories had been stealing his ideas.That led him to fire all his employees, among them Charlie's Grandpa Joe. One day, Wonka informs the world of a contest in which five Golden Tickets have been placed in five random Wonka Bars worldwide and the winners will be given a full tour of the factory as well as a lifetime supply of chocolate. One ticket holder will be given a special prize at the end of the tour. It was a great movie. The special effects were fantastic and the plot was so exciting and original. The music was also excellent! I loved the Oompa Loompas! I would definitely recommend to anyone who likes fairy-tales and magic! Back to blogging, girls!!! Wow, you rock! Bravo Nassoula!